Delineation of the mechanisms that establish and maintain the polarity of epithelial tissues is essential to understanding morphogenesis, tissue specificity and cancer. Three-dimensional culture assays provide a useful platform for dissecting these processes but, as discussed in a recent study in BMC Biology on the culture of mammary gland epithelial cells, multiple parameters that influence the model must be taken into account. "The cell in culture, indeed, is an adaptable organism. Unless conditions are strictly defined, the answers will have little relevance to the questions asked. ...There is one point, however, that cannot be emphasized enough: While it is true that the usefulness of a culture system is increased by how far it is developed to mimic the in vivo situation, we use cultured cells because the in vivo events, in fact, are not well understood. .... We use cultured cells because we can simplify the milieu to understand normal physiology. We also use them to learn how to manipulate gene expression. While the molecular biologists reorder the genes, the cell and developmental biologists, by defining the cellular (micro)environment, may call the shots in the long run" . Nearly 30 years later, it is time to ask: where to now? Control of context - defined here as the microenvironment and architecture of a cell culture - is essential to both the design and the interpretation of experiments performed in three-dimensional (3D) culture. In these cultures, multiple microenvironmental parameters, such as cellular and tissue stiffness, composition of the extracellular matrix (ECM) and media (a substitute for lymph and blood), and cell-cell interactions, operate as they do in vivo and profoundly affect function (see Lelièvre and Bissell  for a comprehensive review of the importance of context in 3D cultures). 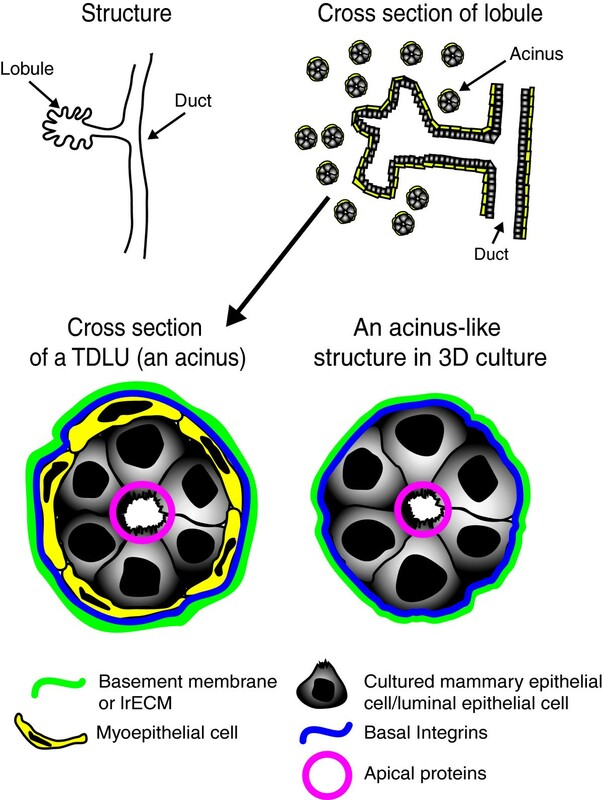 We know that tissue architecture can be approximated in 3D culture; in particular we have succeeded in recreating the milk-producing mammary glandular epithelium and polar acini - the ductal tree - of the human breast in culture (for a discussion of why it is preferable to use 'in culture' rather than 'in vitro' see ) (Figure 1). We also know that signaling pathways in 3D cultures are regulated in a fundamentally different way than in cells cultured on tissue culture plastic (referred to as 2D culture) . Finally, there is substantial evidence that disruption of tissue architecture is a prerequisite to malignancy [4, 5]. Thus, we must be concerned about the structural elements of the model system that are crucial for functional integrity. Architecture and morphology of the mammary gland. (a) A cartoon representation of the structure of the epithelial tissue of the human mammary gland indicating a large duct branching into a lobule. (b) A representation of a cross section cut through the bilayered epithelia: many bilaryered acini that are part of the lobule would be apparent yet their direct connection to the lobule 'disappears' in the 2D cross section. (c) A magnified cross section of the terminal ductal lobular unit (TDLU) referred to as an acinus. Acinar polarity is demonstrated where apical proteins face the lumen formed by luminal epithelial cells and the basement membrane (BM) is in contact with myoepithelial cells (d) S1 cultured cells form a single layered acinus-like structure in 3D culture with apico-basal polarity despite the lack of the myoepithelial layer. Epithelia are structurally and functionally defined by the polarized distribution of organelles and proteins: function, growth and survival of epithelial cells correlates with the degree of 'tissue' polarity. Formation of polarized epithelial tissues arises from a dynamic reciprocity between signals from the microenvironment and the genome  leading to the changes in the pattern of gene expression. The process of tumorigenesis disrupts both the microenvironment and the polarity of the affected tissues . Substantial progress has been made towards understanding the integration of the signals that lead to both formation and disruption of polarity . In the context of the recreation of mammary gland acini in culture, a recent study in BMC Biology from the laboratory of Sophie Lelièvre (Plachot et al. ) reopens the dialog on the importance of apical polarity in modelling mammary function and how this could be affected by culture conditions. A fully formed organ is exponentially more complex than cells in culture, but cultivating cells in 3D begins to bridge the gap in function and consequently retains some of the knowledge that is lost when we destroy the structure of the organs and tissues by separating the cells and culturing them in 2D. There is much wisdom in the architecture of the organs. How else could there be such a rich array of functional differentiation in different organs given that the DNA sequence is the same in all the ten trillion cells of an individual? Primary cells isolated from tissues are an ideal starting point for 3D cultures since such cells still contain some of the memories of the organ. Unfortunately, primary cells are in limited supply, especially from humans. In addition, they are not easy to manipulate genetically, and individual samples will have considerable heterogeneity that could interfere with experimental reproducibility. Last but not least we still have not found a way of making all the relevant cells survive in culture. As an alternative to primary cultures, cell lines have been developed from both normal and tumor tissues. Where some fundamental comparisons are made and similarities established between the primary cells and the respective cell line, then the benefits of studying cell lines are many. These include such features as tractability, reproducibility, availability and homogeneity, although these traits need to be recalibrated from time to time in relation to the corresponding primary cells. Cell lines grown in 3D reduce the complexity of the in vivo state and allow us to manipulate culture conditions and functions. In addition, they could provide keys to the information encoded in the tissue architecture. Many of the 3D culture studies of non-malignant human breast epithelial cells have been performed using two breast epithelial lines, HMT-3522-S1 (S1)  and MCF10A , both of which were featured in the initial publication that described the 3D culture assays of human breast . Both cell lines were isolated from fibrocystic breast tissues, and both form relatively homogeneous organotypic acinar structures resembling in vivo terminal ductal lobular units when placed in 3D culture in laminin-rich extracellular matrix (lrECM) (Figure 1). We refer to any extracellular matrix gel rich in laminin-111 including the commercial products Matrigel™ and Cultrex® as lrECM. Since the initial publication, MCF10A and S1 cells have only rarely both been used in the same study, and so it is welcome that Plachot et al. began their study with a comparison of these lines so often used separately to study mammary gland function and polarity. They measured the baso-apical polarization of acini formed in 3D lrECM by immunofluorescent visualization of basal integrins and apical tight-junction proteins. Careful attention was paid to growing both cell lines according to established protocols for each culture condition. Plachot et al. find that both cell lines establish basal polarity; however, the acini-like structures from MCF10A cells continue to grow with increasingly large apical cavities as a function of time and acini grown from S1 cells do not always contain obvious lumina or only form small ones. Overall, however, S1 cells have a significantly higher frequency of baso-apically polarized acini compared with MCF10A. Indeed, the MCF10A cells did not appear to establish any apical polarity at all under the usual 3D culture conditions. This was demonstrated by multiple markers, including many tight junction proteins. Plachot et al. then went on to investigate in more detail the conditions in which S1 cells could become apically polarized and investigated the importance of the media and ECM composition in this process. Despite many studies in the 1950s and 60s that showed the importance of medium composition, very few scientists pay close attention to the composition of the medium in which they grow their cells. However, the composition of the media is as consequential as the substratum for how the cells behave (for a detailed discussion see ). S1 cells are grown in a defined media with only a few essential additives  whereas MCF10A cells are grown in 5% horse serum plus additional additives . Serum has been a boon for cell biologists as it can support the growth of most cells, but the plethora of components in serum are still poorly defined and the product is subject to considerable batch-to-batch variation. Therefore, experiments using serum cannot be rigorously controlled. As a proof of the above principle, Plachot et al. find that the standard medium used for MCF10A cells nearly abolished apical polarity when used to grow S1 cells in lrECM. Conversely, when MCF10A cells were cultured in S1 medium, some of the acini (about 5%) organized apical polarity. There are clearly cell-intrinsic differences between the two cell lines because under these conditions 65% of S1 acini contained apical polarity. Nevertheless, it is clear that MCF10A cells went from 0% to 5% and S1 from 5% to 65% apical polarity with the change of medium . It took decades from the classical studies of Michalopoulos and Pitot  and Emerman and Pitelka  on floating collagen gels before other laboratories started to pay serious attention to the importance of ECM in tissue-specific gene expression in cultured cells. The presence of a basement membrane (BM) in floating collagen gels was shown initially by electron microscopy . Studies from the Bissell laboratory established that cells on floating collagen gels  produce an endogenous BM and that the BM molecules are crucial for formation of tissue-specific form and function [15–17]. The BM is a form of ECM rich in collagen IV and tissue-specific laminins that underlies epithelia and is in direct contact with the epithelial cells as well as with other cell types (for example, endothelial and fat cells). In vivo, epithelial polarity is established along with the formation of a BM as organs are formed. Laminin-111 is an important component of both the embryonic and mammary gland BM as well as a major component of lrECM; it usually polymerizes into a multivalent signaling scaffold at the surface of cells and tissues. Studies on embryonic development previously reported that type IV collagen likely stabilizes BMs  and is necessary for embryonic development. The assembled BM serves multiple functions as a scaffold, a barrier and a signaling entity necessary for organization of the tissues and organs. Petersen et al. showed formation of a human-derived BM when human breast cells were grown in mouse-derived lrECM gels. Plachot et al. also find a continuous BM in their 3D cultures. What is important here is their finding - reminiscent of the embryonic BM - that type IV collagen most likely stabilizes the laminin-111 polymer in 3D cultures of mammary cells, and that this may be directly related to the capacity of S1 acini to establish apical polarity (Figure 2). Organization of basement membrane superstructure. A simplified and hypothetical diagram showing how BM might be assembled at the surface of a cell or an acinus. (a) Top: acinus surrounded by laminin-111 (green). Bottom: the laminin-111 polymerizes and engages integrins (blue) on the basal face of the epithelial cells. However, the laminin-111 polymer is not stably anchored into a supramolecular structure. In this case, apical polarity is not established and tight-junction proteins (pink) do not get organized on the apical surface of the acini. (b) Laminin-111 polymer (green) is anchored by type IV collagen (red); co-localization of the two proteins is shown by yellow. The proteins are now physically connected by nidogen (black). Basal integrins (blue) are organized and are likely to be held in a spatial orientation that allows proper signaling for establishment of apical polarity. Tight-junction proteins become organized apically in the acinus, and apical polarity is established. Plachot et al. selected the S1 cell line for further study because of its ability to form apical polarity, and compared the behavior of cultured S1 cells on multiple substrata. A number of biological matrices, such as those isolated from the EHS tumor  (Matrigel™ or Cultrex® BM) and synthetic substrata (for example, PuraMatrix™), were tested. The only substrata that allowed formation of acini with basal as well as apical polarity were those that gelled and contained laminin-111 . This is curious given that chicken basal lamina (CBL) has laminin-111 and type IV collagen, but did not encourage endogenous BM formation or apical polarity. CBL does not gel and must be used as a drip of extracted proteins into the culture media and a possible explanation for the lack of S1 polarity could be that this matrix can not be organized to model the 'stiffness' of the mammary gland. 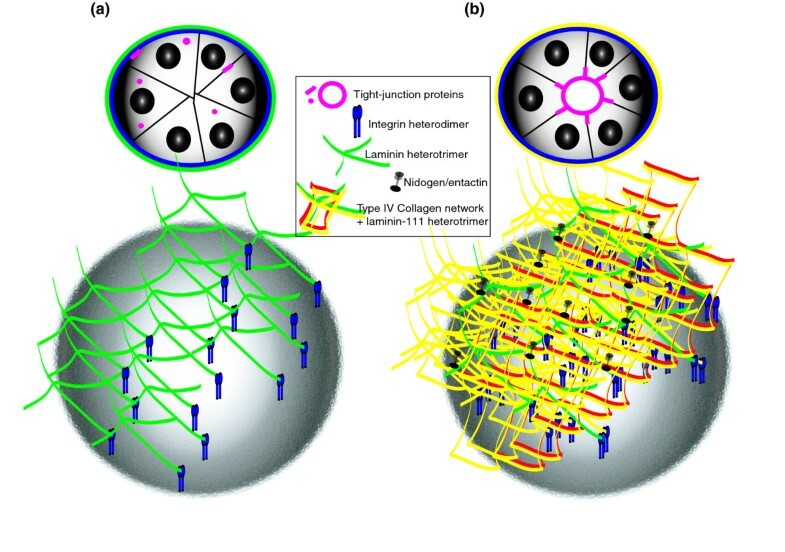 Evidence is accumulating that the stiffness of the microenvironment influences cell behavior, and thus the stiffness of the substrata chosen should approach that of the tissue being modeled. The mammary gland is embedded in a 'soft' fatty microenvironment and lrECMs (such as Matrigel™ and Cultrex® BM or a mix of collagen gels and laminin-111) approximate the softness/stiffness of this microenvironment [20, 21]. Use of substrata derived from EHS tumors (Matrigel™ and Cultrex® BM) is not without its drawbacks: these BM substitutes are produced by a tumor grown in a mouse, and they contain many proteins in addition to type IV collagen and laminin-111 and other components that, like serum, can influence cell behavior. In addition, the commercial preparations are expensive and subject to variation from batch to batch. If batches are pre-screened, however, they can still allow physiological behavior in a way that the available synthetic substrata do not yet. In summary, exogenous scaffolds cannot completely substitute for the natural BM of a tissue, but can be tailored to approximate the ECM of a specific cell or tissue. Plachot et al. devised a modified high-throughput method for delivery of lrECM proteins. They dripped lrECM onto S1 cells on a glass surface with no pre-coating - as opposed to what was done before on tissue culture plastic . Because mammalian cells do not adhere well to glass, under these conditions S1 cells in combination with lrECM form acini by organizing the lrECM material around them. This method reduces the amount of lrECM used and thus the cost of the assay. It also shortens the length of the original assay to 8 days instead of 10. Another modification of our on-top assay has reduced the time needed for formation of acini to as little as 4 days , but this method does not reduce the amount of the lrECM any further. As well as showing the importance of culture conditions and choice of cell line in devising successful 3D systems, the study by Plachot et al. opens up a number of questions. Both the S1 and MCF10A cell lines produce 'acini' with basal polarity: what properties shared by the two cell lines confer this level of organization that is otherwise absent in tumor cells? On the other hand, the differences in apical polarity are intriguing, and it is appropriate to ask what are the functional consequences of this important difference? Whereas these questions were not addressed in Plachot et al. , current technology should allow us to search for the changes in the genes involved in establishing apical and basal polarity in the two cell lines, and the consequences of loss of baso-apical polarity to functional integrity. Where to now? The biologist's toolbox has expanded immeasurably, but making meaningful progress requires careful consideration and optimization of any culture model that makes use of these tools. Precise manipulation of primary cells in 3D culture is increasingly possible, and many other tissues besides mammary gland are poised for the investigation of dynamic reciprocity in 3D organotypic cultures. An additional area of research that promises to provide considerable insight is the co-culture of different cell types in 3D as was done for luminal epithelial and myoepithelial cells of the breast . Here correct polarity was shown to be dependent on the presence of normal myoepithelial cells. In more recent studies where heterogeneous interactions were examined, S1 cells and endothelial cells were cultured together, the polarity status of the S1 acini determined whether or not endothelial cells could migrate to epithelial cells . These studies, even if still preliminary, indicate the time has finally arrived for seriously attempting to create tissue and organ surrogates in 3D cultures. But it is clear that tissue polarity will continue to play a center role. The work from MJB's laboratory is supported by grants from the US Department of Energy, Office of Biological and Environmental Research (DE-AC02-05CH1123), a Distinguished Fellow Award and Low Dose Radiation Program (03-76SF00098); by National Cancer Institute awards R01CA064786, R01CA057621, U54CA126552, U54CA112970 and U54CA143836, and by the US Department of Defense (W81XWH0810736). The content of this article is solely the responsibility of the authors and does not necessarily represent the official views of the National Cancer Institute or the National Institutes of Health.